Fame & Fortune: where does all this stuff come from? It's an interesting question and one rarely asked without more than some hand-waving rationale being given in response. Fleshing an answer out can take you in interesting directions, particularly if you can inject back story, cool or opportunities for future drama or explosive action. It also lets you construct versimilitude by providing hooks for dialogue and ask interesting plot questions like what happens if scarcity suddenly becomes applicable to certain commodities? The concept of brand-name stuff is not new. Ian Fleming and William Gibson apply brands extensively to provide flavour to their characters and settings. James Bond with his vodka martinis, Walther PPK and penchant for Aston Martin conveys concepts about the man and his habits. You have the same tools at your disposal in certain situations and like all good spices, getting the measure right can add zing to what's for consumption. What's important is that a consequence arises from these brand selections. Bond favours the PPK as his former favourite (the Beretta) got caught in his clothing and led to him getting seriously injured. 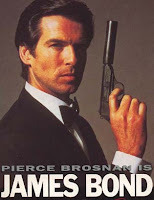 The PPK is not a big gun but is eminently concealable (useful for an assassin) and reflects well on Bond's skill that his use is effective. The tool defines the character and there's a backstory for why which seems true - this provides versimilitude; a sense of truth or reality. Thinking about versimilitude, I was reminded of Verbal's explanation of events in The Usual Suspects, where a swathe of details provided an explanation but conceals the identity of Keyser Soze. While I wouldn't recommend pulling that stunt more than once in a story or campaign, if you're comfortable with improvisation and have the gift of the gab, it's worth a go. You could even construct a wall of stuff and practice the art of the talking point if you want to try it out. The benefits of these choices may be implicit or explicit - the elven cloaks given to the Fellowship of the Ring were said to uber-camouflage; a useful thing when trying to sneak past large armies of orcs! They can reveal associations, have utility in themselves or show attitudes. Going back to Lord of the Rings, Frodo's mithril shirt saves him in Moria and provides a connection to Gimli by virtue of Bilbo having adventured with Gimli's family back in The Hobbit. And as this stuff comes from somewhere, you've got a hook for future expansion. In the Harry Potter series, the best wands come from Ollivander's shop in Diagon Alley. a source of information which becomes critical in later books - providing exposition and hooks for future events involving some wands. It's a trick you can borrow to give depth and continuity. Knowing when is enough is important - follow Shakespeare for as the talkative Polonius ironically remarks "Brevity is the soul of wit." Significant characters deserve this treatment and it's best used with moderation. For everyone to show up like they've stepped out of a catalogue is jarring - the appearance of such items needs to be controlled unless you like losing your audience in a sea of details. If it's significant, then it needs to speak up, which means tying itself to a character or to the situation at hand. Then there's the question of scarcity (and it's evil twin superabundance). What happens when the only known supplier of mithril shirts shuts up shop? Is there someone capable of stepping in to fill the gap? What if your villain has recruited the best wand shop to her cause and has her minions equipped with flashy, effective wands? These are just a couple of extremes, you would equally be able to introduce an arms race between competing sellers.